Team McLeish Bros. has been running for land speed records since 1999, and have used a variety of different cars, engines, and bodies to accomplish many of their goals. 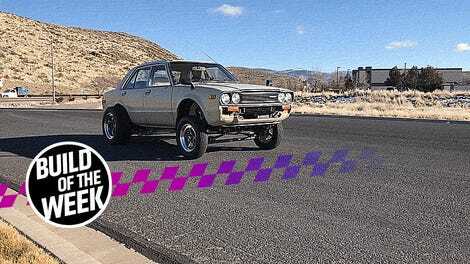 The team has broken dozens of AMA, FIM, SCTA and BNI records, and their aim to own another one has brought them to Bonneville again in 2018 with their newly-rebodied and seriously modified Datsun B110-ish “J” unblown Fuel Competition Coupe. In previous years this has run in various classes with a Triumph GT6 body. I briefly talked to one of the namesake McLeish brothers about the car in their paddock space. The nose cone was off of the car and I was immediately intrigued by what I saw. Effectively a tube-frame chassis with the wheels tucked well inside the confines of the bodywork, the engine sat far back in the chassis and powered the front wheels through a pair of chains and sprockets. That engine, I was told, was a 750cc Suzuki GSX-R mill running on some seriously potent fuel. The team was busy, and the sun had cooked both my DSLR and my iPhone to the point of temporarily non-functional, so I moved on, but couldn’t shake the car from my mind. The next morning I watched the car at the start line and was intrigued by the shape, the sound, the feel, and the smell of the car. Everything about this “Datsun” reminded me of why I love Bonneville. This is the last bastion of run-what-you-brung motorsport. There are dozens of class records to choose from, and if you build your car to that ruleset and run faster, you get that record. In the case of the McLeish family effort, they saw a small-bore displacement category record that hadn’t been contested in a decade, and decided to build for that. The chassis was proven, they just needed to build the right motor. It would seem they have the right combination nailed down, as they ran fast enough on Saturday to qualify for a record-breaking attempt today. 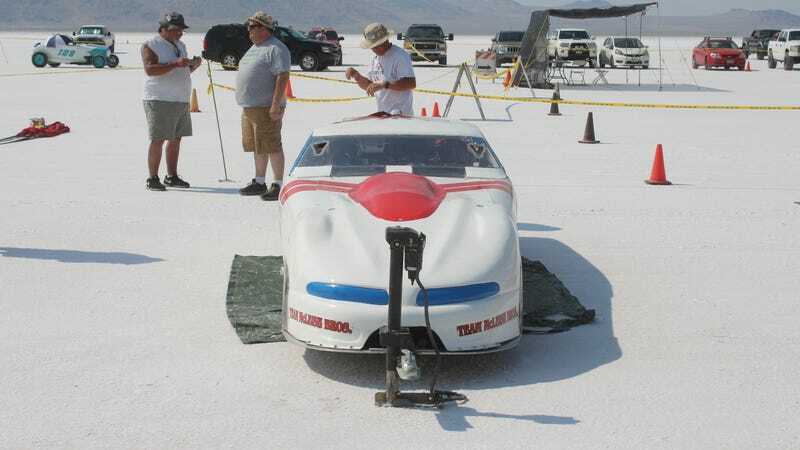 According to the SCTA rulebook, the current record in the J/FCC class is 135.30 mph, and this car ran faster than that.